A motherhood expert teaches the seven essential principles every mom needs to confidently raise her children. Every mother wants her children to grow up happy, healthy, and fulfilled. But reaching that destination can be full of indecision, worry, and second-guessing. Ask any mother, "Do you think you're doing a good job?" and she'll likely give you a mixed answer. 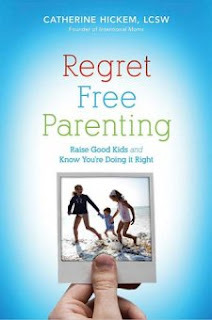 In her groundbreaking book, Regret-Free Parenting, Catherine Hickem offers seven principles for mothers to raise their children well...and know they're doing it right. I really liked this book. It wasn't one of those "here's all the things you're doing wrong in your parenting and here's my opinion about how you need to fix them" books. It was more a gentle guide on how to make the most of the time you have with your children so you can better know how to raise them. She mentions "studying" your children to get a better idea of what makes them tick and what interests them the most. She also wants you to focus on what you truly want for your children and yourself. I found that I couldn't really apply some of the ideas to my younger ones but did see where it would be helpful as they get older. What I did like was that she doesn't give precise answers to things - which I feel is a good thing - because every child is different and what works with one child may not work with another. Instead she gives general ideas and reiterates that you need to pray and ask God to give you direction. Each chapter has questions at the end of it and there's a parenting plan at the end of the book that can be copied which I think makes this ideal for a parenting class or perhaps a women's group study. I enjoyed this book and will definitely keep it on my shelf for future reference. parenting has got to be one of the toughest jobs out there! this sounds like a helpful book! thanks for sharing! Thanks for the rec! Sounds like an interesting read, I may have to browse BAM for it next time I'm in Terre Haute. There definitely is no universal answer to parenting, so I'm glad its not one of those books.